In an unprecedented move, Afghan president Ashraf Ghani surprised the world by proposing peace talks with the Afghan Taliban. He made this offer in his opening speech at the Kabul Process Conference, which was attended by the representatives of around 25 countries, signalling a major policy shift from his earlier belligerent stance. The Taliban, who dominate a vast majority of swathes of Afghanistan, are riding high on the havoc and destruction they have wreaked across the country over the past decade. The mounting human casualties and loss of infrastructure across the country to this day signals a staggering surge in the might of the Taliban, who spare no chance to inflict heavy losses on the public in general and the Afghan government in particular. Despite punitive action taken against the Taliban in a war that has lasted over a decade, the US-backed Afghan government has not been able to dismantle their strong network, with a recent report suggesting that the Taliban are still openly active in 70% of Afghanistan. In light of this context, it makes sense for the Ghani-led Afghan government to see no other way of pulling out from this quagmire, except by paving the course for a result-oriented and meaningful dialogue with the Taliban in order to move Afghanistan forward as a whole, without the insurgents holding it back. However, one cannot help but wonder what the ground reality would be in Afghanistan, had Ghani and his predecessor, Hamid Karzai, taken proactive action years ago to make this incessant war less bloody by at least half a decade. The same offer, if made earlier, could have led to saving countless lives of civilians and military personnel alike, had the Taliban been recognised as a legitimate political entity. Nonetheless, as the saying goes, what’s done is done, and we can only look forward from now. Given Afghanistan’s volatile past, it is never too late to start a new chapter to re-shape the history of this war-torn country. In another important move, President Ghani also invited Pakistan to play a role in the Afghan peace process ­– a process that Islamabad has always advocated and requested to mediate in order to bring an end to the deadly war that impacts Pakistan as well. The diplomatic ties between the two countries have seen many ups and downs since the creation of Pakistan. Just recently, Ghani accused Pakistan of orchestrating a series of attacks that took place in Kabul, which resulted in the deaths of hundreds of people. Pakistan vehemently denied and subsequently rubbished these baseless claims, marking another low point for Pak-Afghan ties. Nevertheless, Pakistan has long held the narrative that a strong and peaceful Afghanistan is in the best interests of its national security and sovereignty. Due to this, soon after Ghani made the peace offer, Pakistan supported the effort and offered its full support and cooperation to ensure peace in the region. Having said that, the Afghan government’s deplorable habit of holding Pakistan responsible for what are its own failures to safeguard Afghan territory, does not bode well for a peace process. This is why, now that the Afghan government is willing to recognise the Taliban in order to restore some semblance of political and security order to Afghanistan, it is also advisable that they recognise the Durand line. The Pak-Afghan border is a bone of contention between the two countries, and resolving the matter will be essential for both countries to move forward along the trajectory of peace and prosperity. 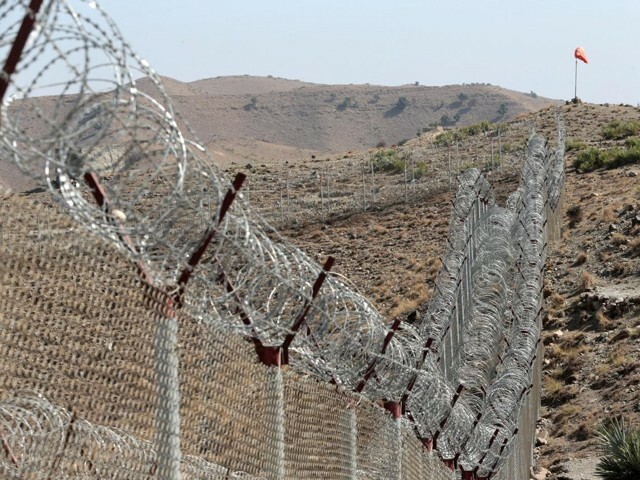 Pakistan, for its part, has already begun fencing the 2,611 kilometres long, porous border, a process that will be completed in two phases, according to the Pakistan Army. The first phase will see the fencing of areas with high infiltration, mainly the Bajaur, Mohmand and Khyber agencies. In the second phase, the remaining parts of the tribal areas and Balochistan will be fenced. In addition to the fence, 750 forts are to be constructed along the border and installed with highly operational surveillance systems, in order to ensure no one enters either side of the border without proper documentation. However, Afghanistan continues to oppose tooth and nail the fencing of the border, along with any other move to recognise the Durand line. This policy of non-cooperation on part of the Afghan government has to change, as the bad blood between the two neighbouring countries cannot be resolved unless there is a willingness to bury the hatchet once and for all. If the Ghani-led Afghan government can recognise the Taliban as a legitimate political organisation, then why can it not recognise the Durand line as the international border between the two neighbours? The border between the two countries is set and has been so for the entirety of Pakistan’s existence, which is why Afghanistan must not squander more time in accepting this ground reality. It must recognise the fact that extending an offer of recognition to the Taliban while continuing to remain adamant and intransigent on the legitimacy of the Durand line is not lucrative diplomacy. Pakistan, on the other hand, should help bring the disgruntled Afghan Taliban on the negotiating table with Kabul by using its leverage. With a group of 70 Taliban ready to join the peace process after earlier being less receptive to the idea, clearly Pakistan is keeping its end of the bargain. Over the years, it has been disappointing to see the peace effort in Afghanistan only being pursued through military means. We have seen the US and NATO achieve next to nothing, despite employing all the resources at their disposal over a period of 16 years, as they failed to bring any measure of stability to the war-ravaged country. There is always more than one way to reach a goal, and in the case of Afghanistan, it is clear that there is no way forward that leaves out the Taliban. It is thus high time that Afghanistan and Pakistan work together towards achieving their mutual goal of stability and peace, which is the only way forward to put an end to decades of violence and insurgency in the neighbouring Afghanistan. As for Pakistan, the military as well as the civilian government should try their utmost to mediate and make the Afghan peace process a success, so that the wave of terrorism that emanates from the volatile and unstable Afghanistan and affects Pakistan’s stability can finally be brought to a halt. also known as Bharat Juniors recognizes the Durrand Line? India is hunting down terrorists and protecting the non-Muslim minorities from fanatics. Please tell us why Taliban didn’t recognize Durand Line as border when they were in power? Looks like there is bipartisan support for not recognizing Durand Line as border. No? One does not recognise the border drawn in air which is what durand line is? One way to resolve the border issue would be to allow afghanistan a direct access to warm waters which could then replace the current meaningless durand line. Confusing comment. Cannot make head or tail. But will attempt it. It was just a matter of ‘when’. Pakistan would have been created sooner or later. now, in Bharati Occupied Kashmir. Evidently, as everyone knows Mullah Omar is no more. Current Taliban leadership is fractured. Policies change. Ghani barely controls Kabul. Every day he loses more. rupees. In parts, near Iran border, they use Iranian rial.